"I will recommend your company for table tops. You did a wonderful job on mine." "You did a great job on our euro door." "Your men were very nice and speedy. Our window looks fabulous!" "Thank you for having your men come out so quickly and repairing my broken windows. How very lucky I am to have contacted your company." "The installers of our new bay window were very professional. They completed the entire job in one day and cleaned up everything before they left." "Quick and professional service. Would recommend their services to everyone." "You guys did a great job installing both shower doors in my house. Thank you!" 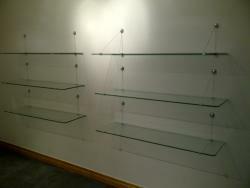 Glass shelves installed with cable supports. We can polish shelves in-house for quality and quick service. Tight tolerances were required for the notched and mitered wall panel to the right of the door. Tub extension forms a seat inside the shower. We design and install complex Euro shower enclosures. Frame less Euro shower door with notched panel and 90-degree return on a buttress. This design allows for a seat in the shower. We specialize in frameless shower enclosures (Euro-style) and custom mirrors for the residential and commercial market. Serving Romeo and the greater Macomb county area for over 25 years. Our staff is unmatched in quality, efficiency, and attention to detail. We provide fast, reliable service for your home or business! © Peters Glass & Screen Service, Inc.